A full range of Fibreglass Centre Ridge Chimneys to give lasting peace-of-mind to the busy Commercial Poultry Farmer or Poultry House Builder. 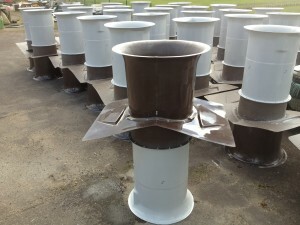 Ease of installation along with efficient air-flow and easy cleaning makes our poultry ventilation chimneys the popular choice for literally thousands of Poultry Farms all across the UK. A unique, fully-assembled design eliminates time consuming site work – meaning you can simply install your choice of exhaust fans and away you go! High grade stainless steel fixings are used and all our poultry ventilation chimneys include a generous roof sheet, a backdraught shutter and fan mounting brackets – It really couldn’t be simpler! Partnered with our one-piece GRP Poultry Air Inlet Hoods these chimneys really enhance your building and mean that when it comes to cleaning, you can pressure-wash all our fibreglass products as many times as you like – they will not degrade, rot or rust.